Emmett D. Carson, Ph.D., CEO and president of Silicon Valley Community Foundation (SVCF) and nationally recognized philanthropy leader, has been selected as the first person to serve in the Charles Stewart Mott Foundation Chair on Community Foundations at the Indiana University Lilly Family School of Philanthropy, school officials announced today. He will be appointed visiting holder for the new chair, which is dedicated to understanding and strengthening community foundations. Carson will continue to serve as CEO and president of SVCF during his appointment. The faculty chair, which was unveiled earlier this year, commemorates the 100th anniversary of community foundations in the United States. Through teaching, research and public service, its holders will contribute significantly to understanding and enhancing the important work of community foundations. This fall the school will begin a search for the first full-time chair holder, who is expected to begin serving in the position in fall 2015. As founding CEO of SVCF, Carson led an unprecedented merger of two of the world’s largest community foundations. SVCF now has over $4.7 billion under management; it is both the largest grant maker to Bay Area nonprofits and the largest international grant maker among U.S. community foundations. Carson previously was CEO of The Minneapolis Foundation and prior to that oversaw the Ford Foundation’s U.S. and global grant making program on philanthropy and the nonprofit sector. “Community foundations have a vital role in addressing problems facing their local communities, and they can foster charitable giving across the globe as well. I can’t think of a better place to teach students the value of these services than the Lilly Family School of Philanthropy. I am deeply honored to be the first person to serve in this important role,” Carson said. As the visiting chair holder, Carson will serve as a public scholar. He will visit Indianapolis several times in the upcoming academic year, during which he will give public lectures, guest lecture in the school’s academic classes, develop a syllabus on community foundations and philanthropy, mentor students, conduct research to increase knowledge about community foundations, and engage with local community foundation and nonprofit leaders. Carson is a long-time colleague and advisor to the school. He delivered the keynote address at its inauguration in 2013, is a frequent speaker at its annual national symposium and is an adjunct member of its Philanthropic Studies faculty. 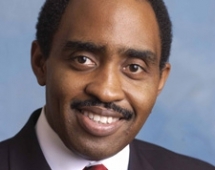 He formerly served on the Center on Philanthropy at Indiana University’s Board of Governors and received an honorary doctorate from Indiana University in 2007. Beyond his community foundation and grant making expertise, Carson is a noted authority on issues of social justice, public accountability and African American giving. He is consistently recognized as one of the most influential nonprofit leaders in the U.S. In addition to Indiana University, he has honorary degrees from Morehouse College and The National Hispanic University. He received both his master’s and Ph.D. degrees in public and international affairs from Princeton University and his bachelor’s degree in economics, Phi Beta Kappa, from Morehouse College. The Mott Foundation, established in 1926 by an automotive pioneer, is a private philanthropy committed to supporting projects that promote a just, equitable and sustainable society. It supports nonprofit programs throughout the U.S. and, on a limited geographic basis, internationally. Grantmaking is focused in four programs: Civil Society, Environment, Flint Area and Pathways Out of Poverty. In addition to Flint, offices are located in metropolitan Detroit, Johannesburg and London. With year-end assets of approximately $2.5 billion in 2013, the Foundation made 400 grants totaling more than $101 million.